In June, the CBS series NCIS was named the most popular drama in the world with more than 57 million viewers in 2013. One company in Missouri played a small but important role in that success. Play-Mor Trailers in Westphalia builds custom trailers for film and television productions. In recent years, the trailers have been used on popular shows such as NCIS, CSI, Lost, Grey’s Anatomy, and many other productions that can’t be named due to non-disclosure agreements. “We know we’ve had a lot of stars in them, but we can’t always say who is in them,” says company owner John Willibrand. The company started building trailers in 1964. It was 20 years before the film industry became a customer. Today, producing trailers for film productions makes up a significant part of Play-Mor’s business. Willibrand says Play-Mor, with 35 employees, has built a strong reputation in the industry for creating heavy-duty trailers that are well-suited for the rigors of a busy production schedule. Play-Mor also stands out thanks to the company’s ability to customize its trailer designs. Play-Mor generally builds for rental companies that provide trailers and other equipment for film productions. These rental companies need a wide variety of trailers to support various television and feature film productions. With an in-house manufacturing line, welding shop, and paint shop, Play-Mor has the ability to produce trailers with living quarters for one, two, or three actors. In addition, they build toilet trailers and trailers for production use. They also create hair, makeup, and wardrobe trailers. 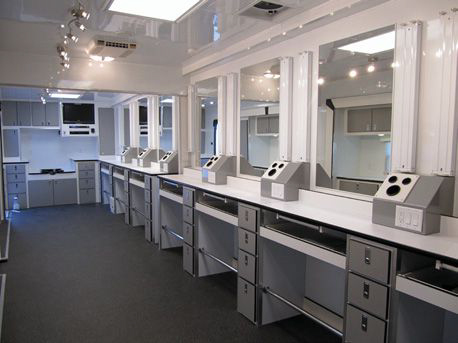 For the actors’ trailers, Play-Mor offers a variety of premium options such as leather furnishings, different flooring options, satellite television, and sound systems. Selling to film rental companies is a slow process; Willibrand says that it can take up to two years of talks to make a sale. Once an order is finalized, it takes two to four weeks to get the right parts. With Play-Mor’s rural location, Willibrand sometimes has to travel more than 100 miles to get a specialized part. But once the craftsmen on the production line have everything they need, the trailer can be assembled in less than five days. The finished product can weigh between 11,000 and 20,000 pounds. Hired drivers then come to Westphalia to pick up the trailers and transport them to wherever they need to go, often places such as Louisiana, Oregon, Vancouver, and California. Play-Mor has sold film trailers that were even shipped to Hawaii. The company is always exploring ways to increase its business with film and television productions. Serving this high profile industry is both challenging and rewarding. “It is a very exciting part of our business,” Willibrand says.